Upon first meeting one another there is an instant connection and immediate bond. The feeling is as if you have known each other before and there is a feeling of familiarity. Whether you have both met in physical person or not, there is usually a peculiar sensation--an intuitive knowing--that you will play an important role in each other's life. Telepathy is more common and even natural within twin soul connections. Telepathic communication occurs frequently as each twin can sometimes pick up on the other's thoughts or feelings. Twin flames often reflect each other's moods and can feel each other at a distance. Whatever is effecting one twin, whether mental, physical, emotional or spiritual, often effects the other. The eyes are the windows to the soul. When twinflames gaze into one another's eyes there is a profound intensity. Making eye contact with your twinflame can feel unusual at times because it is as if you are staring into your own soul; what you feel often depends on what aspect of your own soul your own soul you are seeing--anything that is being repressed or that needs to be healed will also be felt and reflected through the eyes. Moments when there is a overwhelming feeling of unconditional love. The feeling can be felt very intensely in one or more of the chakra centres, especially the heart chakra. The love can be absolutely explosive and expands one into a feeling of oneness with their twin, and this feeling is often expanded to encompass a feeling of spiritual oneness with all things. The chemistry between the twins can be extremely powerful. There are moments of complete certainty that they are meant to be in each others lives for a reason, no matter what, and that there is a higher purpose for their union with one another. All emotions, whether negative or positive, is amplified between twin flames. Feelings are often exaggerated compared to other relationships. When things are good it feels incredibly good! But when things are not going so well, the feelings can be incredibly painful. There is more emotional and energetic intensity between twinflames because things are felt on a soul level. Since twinflames are often empathic with one another, it can become an overwhelming emotional roller coaster at times when they are absorbing each others emotions alongside feeling the intensity of their own. Reoccurring numbers or repeated number sequences are are common occurrence within twinflame connections. The 11:11 and other number synchronicities are also a common feature. There may be similarities and synchronistic patterns found within each of the twinflames birthdates, anniversaries, addresses, phone numbers, anniversaries and major life events. Both twinflames may have unusual dreams involving the other and telepathy often occurs between twins in the dream state. 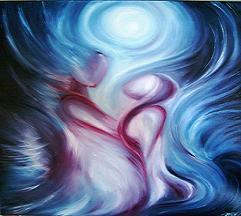 Many twinflames have shared or reoccurring dreams of one another, often prior to actually meeting their twin. Major themes in the twinflame relationship or issues that must be worked on together or in the individual life of one of the twins is often featured in dreams, and even in day dreams or visions. Separation is a common theme in the twinflame relationship. There is usually a swinging back and forth from reunion to separation. The separation either occurs because of distance or an inability to be together in the physical for one or more reasons. Often the separations can occur if their is turbulence within the relationship due to unresolved emotional baggage that one or both of the twins is carrying. The reunion takes place again when healing is ready to occur. There is an intense repelling and magnetic attraction that takes place between twins; a pushing and pulling which indicates that much healing work still needs to be done before a permanent reunion can occur. The twinflame relationship changes your life. Each twin is transformed in many ways throughout the connection. The twinflame relationship challenges each soul to grow and expand into their highest potential to fulfill their mission and purpose on the planet and in each others lives. This constant changing and expansion can occur quote frequently and rapidly within the twinflame relationship. Often it is so intense that one of the twins may run from the relationship, or there may be difficulty in being together for long periods of time. Twinflames are connected even at a distance. Telepathy and empathy are common between the twinflames. Each twin may pick up on the others thoughts they may find themselves often calling, texting, or emailing around the same time, and also finishing each others sentences. Synchronicities and unusual parallels often occur within the lives and daily events of each of the twinflames.